« Java – Should I disable it ? With iPhones and iPads capable of not only pictures, but High Definition Video, we are in a generation of sharing our memories in motion. Join us this month as we take a look at video capture, basic editing, and sharing. 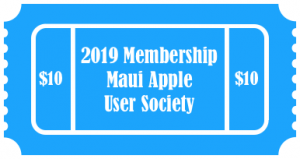 We will discuss products designed for the consumer and professional as well as discuss how to handle all your video storage needs, online services such as YouTube, and a variety of other video topics related to your Apple products. For directions to our meetings, click here.